"An incredible selection of sayings." In Wonder, readers were introduced to memorable English teacher Mr. Browne and his love of precepts. 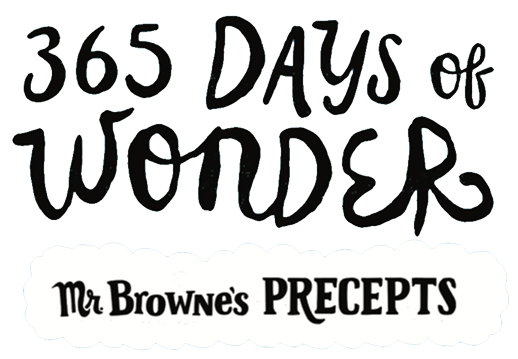 Simply put, precepts are principles to live by, and Mr. Browne has compiled 365 of them—one for each day of the year—drawn from popular songs to children’s books to inscriptions on Egyptian tombstones to fortune cookies. His selections celebrate kindness, hopefulness, the goodness of human beings, the strength of people’s hearts, and the power of people’s wills. 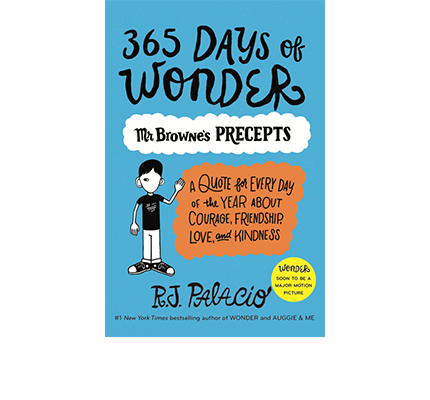 365 Days of Wonder is a wonderful book that is the perfect gift or keepsake for fans of WONDER, collectors of precepts and, actually, just everyone. "...Mr. Browne’s essays at the end of each month add a much-needed adult perspective on the need to guide young people in the ways of kindness and empathy. A big collection of inspiring words that will appeal to the legions of fans awaiting more wonder in their lives." "This is a companion book to the incredible WONDER, and its thoughtful collection of sayings reflects the feel of the book. It's an eclectic selection of quotes and words of wisdom, one for every day of the year." Palacio has an uncanny grasp of the minds and hearts of 8- to 12-year-olds, and the people who used to be them. I love this beautiful little book so much that I want to carry it around with me every day ... Without a doubt, one of my favourite publications of 2014 and the best non-fiction book to appear in my post box. I really can't say enough good things about it! 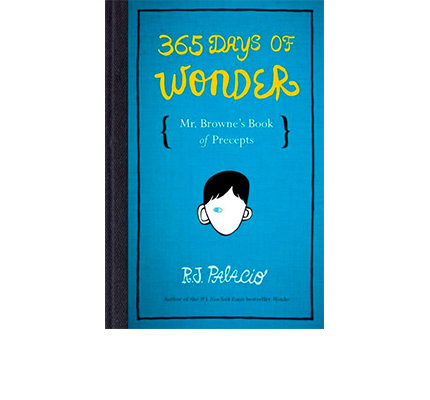 "Palacio's masterpiece, WONDER (Knopf, 2012), has spawned a nonfiction companion featuring precepts, or words to live by, from Beecher Prep's beloved teacher Mr. Browne. The book opens with Mr. Browne discovering his love of precepts in a line from a book written by his namesake, the 17th-century English author Thomas Browne: "We carry within us the wonders we seek around us." What follows is an incredible collection of sayings, many that emphasize the importance of kindness. 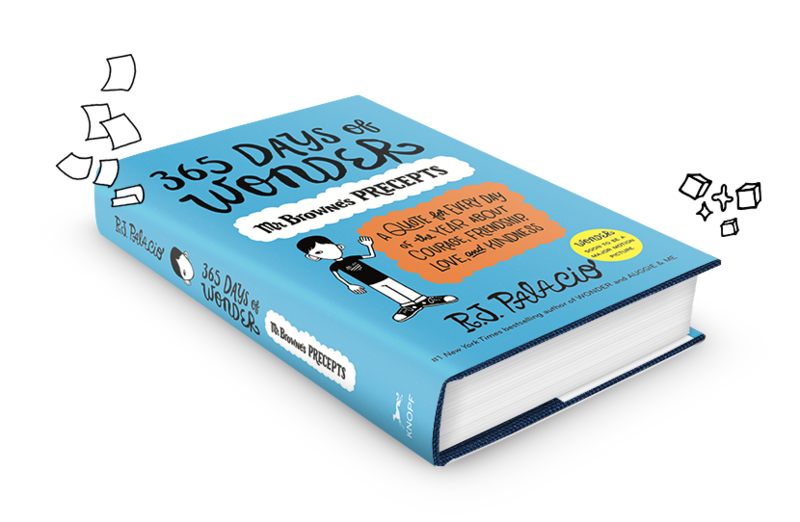 Presented in calendar format, including the month and day, though not the year, the 365 precepts are collected from great literary efforts, the annals of history, and the contributions of child readers of Wonder, chosen by Palacio herself. Each month concludes with a written offering from Mr. Browne, with intermittent input from Wonder's most important characters. These salutary compositions fill in missing details from the original story, provide an update for the characters, and expand on the meaning of the precepts. What seems by description a novelty item is in fact anything but. The quality of the selections, the closure obtained from the added Wonder details, and the thought-provoking opportunities for teachers, parents, and students make this a recommended purchase for libraries where Wonder is popular".